When any emergency notification is received by the State of Hawaiʻi, the State Waring Point will activate the outdoor sirens statewide. Warning advisories will also be transmitted via cellular telephones, AM/FM radio, and television. Where is the best place to take refuge if there is a nuclear threat or radiation emergency? Get inside a building immediately. Stay inside and stay tuned. Radioactive material settles on the outside of buildings; so the best thing to do is stay as far away from the walls and roof of the building as you can. If possible, turn off fans, air conditioners, and forced-air heating units that bring air in from the outside. Close fireplace dampers. A basement or room underground is the best place to be. If you don't have a basement, stay as low as possible in the middle of the building away from windows and doors. Do not remain in your car. Run to the closest building and stay in the middle of that building. Get Inside, Stay Inside, Stay Tuned. Whether the emergency is a natural or a manmade disaster, it is important to be prepared for hurricanes, fires, civil disasters, bomb threats, other natural disasters, and now, nuclear threats. Plan to meet the unique needs of your family, such as supplies for pets and seniors. For information on basic disaster supply kits. 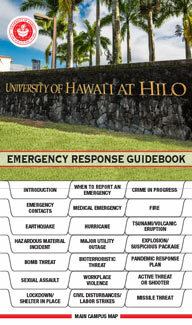 View the UH Hilo Emergency Operations Plan (EOP) for information on preparing for hurricanes, fires, civil disasters, bomb threats, and other natural and manmade disasters.